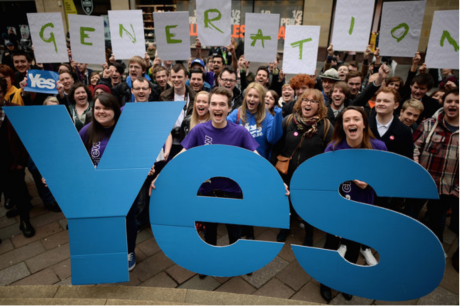 The Scots indyref was a watershed moment. But the debate hasn't gone away and large parts of pro-union opinion seem more angry and in dismay than they did last year. This points to future problems for the continuation of the UK. Scotland is still making the news. The tartan tsunami that is the SNP surge shows little to no sign of abating as election day approaches. Beyond Scotland’s shores the UK and international media are making frequent references to the debate north of the border. Strangely some of this coverage – mostly in London based outlets – is even more ill-informed and inaccurate than was seen during the indyref. This is itself no mean feat. Then most neutral and pro-union opinion thought No would win. They had two years to understand and come to terms with the indyref debate, knew its date from a distance and some of the contours of the environment. After the indyref things were meant to return to the status quo. Normal service would be resumed. Scotland anchored into the union anew would do its usual thing and return a bloc of 40 or so mostly non-descript Labour representatives to Westminster. The SNP after its rebuttal in the referendum would slowly see the shine wear off their credentials in government as fiscal realities and the constraints of devolution took their toil. Scotland has not gone back to anything resembling normal service. Something has profoundly changed about how the Scottish public see and do politics and their role in the union. Passivity, acceptance and belief in traditional elites – Labour included – now seem a thing of the past. Not surprisingly some cannot grasp the scale of change and are having difficulties understanding it. Take ‘the Guardian’ liberal class view of Scotland. The paper was happy to present numerous caricatures of Scotland during the indyref, such as of ‘acts of violence’ post-independence and citing the example of Ireland after the 1921 Anglo-Irish treaty. Polly Toynbee noted Alex Salmond invoking the myths of Robert the Bruce and ‘freedom’ then said: ‘That’s what fighters the world over say, whatever their cause is, good or bad, in Iraq, Syria, Ukraine, Gaza, Israel, Sudan, Libya or Afghanistan’. In the last week a tone of panic and hyperbole has arrived again at ‘The Guardian’. Simon Jenkins wrote with disdain of the three non-English nations commenting that ‘Scotland, Wales and Ulster [sic] were the Greece of the British union, without the austerity.’ This has led to in all three a world of ‘’Benefit street’ economies’ with Jenkins talking about the perils of ‘Treasury subsidies’ and ‘showering power and money on Scotland’. Obviously Simon Heffer and his like write much worse things regularly in the ‘Daily Mail’, but this is the liberal bastion of ‘The Guardian’. This week Polly Toynbee returned to Scotland’s potential impact on the election, writing, ‘The SNP asserts an elemental Scottish difference in political psyche – more collectivist, more egalitarian. More Scots have a cultural detestation of Tories, but attitudes don’t turn red on crossing the border’. This is a set of observations which would find much agreement in any Scottish political discussion. But Toynbee doesn’t leave it there, and goes on to talk of ‘the SNP’s malicious caricature’ of Scottish Labour and of ‘authentic Scottish Labour, no longer a ‘branch office’ of the party in Westminster.’ The first with SNP taunts of ‘London Labour’ is the cut and thrust of everyday politics; the second straight wish-fulfilment with Scottish Labour in relation to British Labour in the exact same place as when former leader Johann Lamont said the Scottish party was treated as a ‘branch office’. Then there is ‘The Economist’s’ serial portrayal of Scotland in a pejorative language talking continually of ‘separatism’, ‘secessionism’ and ‘partition’. In response to a query Jeremy Cliffe of ‘the Economist’ wrote to me ‘I do not understand why you think ‘separatist’ and ‘partition’ are loaded, negative terms. That is certainly not how we use them’. Former ‘Scotsman’ and ‘Times Scotland’ Magnus Linklater has covered both Scottish and British politics for decades. A couple of weeks ago he said that he could barely comprehend the Scotland in front of his eyes, agreeing with William McIlvanney’s recent revision of L.P. Hartley’s ‘the past is a foreign country’, referencing Scotland - ‘when you get to my age the present is a foreign country’ (1). This week, with the election campaign underway, he returned to his theme of what he judged the perplexing state of Scottish public opinion. Attending SNP conference in Glasgow he noted an air of unreality, describing the prevailing sentiment as one of thinking that ‘The SNP will coast to victory in Scotland on a tide of misty euphoria, its eye on the prospect of another referendum and the certainty of victory next time’ (2). Linklater continued his description: ‘The minutiae of political debate are of minor importance compared with the principal message: the SNP is an unstoppable force.’ This offers the danger of Scottish nationalism being ‘hypnotised by its own rhetoric’ – one which will eventually crash to reality aided by public spending cuts, the fall in the oil price, and imperviousness to the weaknesses of the independence argument in the referendum. Linking many of the above comments is a generational centre-left account – one shaped by a progressive pessimism. This can be seen in Polly Toynbee’s continual reference to people using ‘pegs’ to hold their noses and vote Labour in 2005, 2010 and today. There is an over-fixation on Labour and Westminster – which has become more pronounced since the Lib Dems went into coalition with the Tories. There is a distorted view of the United Kingdom, one which is perceived through a Londoncentric view and an international perspective shaped by the wealth and privilege of London as a global powerhouse. This throws up issues not just for Scotland, Wales and Northern Ireland but England outside London. ‘What do you want to go to Hartlepool for?’ an incredulous London journalist asked a Dutch journalist recently who had gone there for the day to examine first hand one of the youth unemployment blight spots of the UK. Some relatively younger pro-union voices (which means fortysomethings and thirtysomethings in this context) do have a more sophisticated understanding. These are less informed by an obsession with the three ‘Ls’ of Labour, London and the left. Examples include Alex Massie, Fraser Nelson and Hugo Rifkind. It isn’t a coincident that these are all centre-right voices and that two of the three are London Scots – which gives them a distinctive take on the state of the union. Rifkind recently wrote a penetrating piece in ‘The Spectator’ that came to terms with the terrible condition of unionism. English unionism was close to being on life support, aided by dissembling and dishonesty from its leading lights. He wrote of the Labour case for the union, ‘Find me a Labour unionist who would still be one if Scotland voted Tory, and I’ll find you a person who still finds that Tories/pandas joke funny’. The union of Hugo Rifkind, Fraser Nelson and Alex Massie is one which is mostly if not entirely reliant on past and passing memories. It has an emotional quality to it: of romance, sensibility and even putting its maintenance above partisan political advantage as in Fraser Nelson’s comment that ‘I’d rather spend a lifetime in a Labour-run Britain than a day in a fractured, diminished, disunited kingdom’. The febrile atmosphere of Scottish politics post-indyref was on full display in the ‘Daily Telegraph’ story entitled ‘Sturgeon’s secret backing for Cameron’. This claimed that a UK Government memo stated that First Minister Nicola Sturgeon had in a meeting with the French Ambassador said she would prefer to see ‘David Cameron remain’ in power and that Ed Miliband was not ‘Prime Ministerial material’; the former the opposite of public pronouncements by the SNP. The story was categorically denied by Sturgeon and the French Consel General who was at the meeting neither of whom the ‘Telegraph’ bothered to contact. One dynamic in this is that the ‘Daily Telegraph’, as well as Scottish and British Labour wanted to believe the story such is their detesting of all things Scottish nationalist. Scottish Labour jumped on it as proof of the age old ‘tartan Tory’ handle, while Ed Miiband, even after the above denials, still tried to use it for political capital, talking of the ‘damning revelations’ the SNP had to answer. The ‘Daily Telegraph’ did not come out of this well: its standards of journalistic integrity and fact-checking playing a distant second to political campaigning and disinformation. But others do not come out of it well who have previously shown insight. Fraser Nelson could not stop himself from viewing the reaction of SNP and independence supporters as illustrating ‘the uglier side of Scottish nationalism’. Nelson went on to say ‘the problem with nationalisms as a creed is that it attracts, as its followers, an angry mob’. He was only talking of Scottish nationalism, but this is true of elements of Scottish and British nationalism. Some of the more passionate and black and white elements of Scottish nationalism are quite ugly and unattractive, engaging in personal abuse, bad politics and inaccurate history. But this is also true of some pro-union opinion – which is also mostly if not completely in denial that unionism is an expression of British nationalism. Thus, a central problem in this is a debate defined by the competing claims of two nationalisms – Scottish and British, one ‘out’ as a nationalism, and the other not ‘out’. Where does this take us as we countdown to the UK general election? Scottish Labour is in a mix of anger and dismay. Post-indyref and facing disastrous polls the prevailing mood of many in the party has been to project their problems onto external forces (the SNP, social media) and fail to examine themselves or look inward and understand that their party became another self-interested elite which the public have turned against in large numbers. South of the border the rest of British Labour is in a very strange place: hardly one of confidence, but not facing the existential crisis Scottish Labour is. Yet it barely has any grasp of what is going on its once impenetrable Scottish fortress. Take the example of the just published collection ‘Why Vote Labour’ (3). What lessons does it draw from the indyref and its explosion of democratic engagement, you might ask? The answer is surprisingly, even in the chapters on community politics and people-powered public services not even one token reference. This says something fundamental: Westminster politics have declared independence from the rest of the UK, and with this Scotland has become de jure self-governing and autonomous. The British political classes are not in a good way. They are not impressive on any measurement or criterion you would use. Whatever the future of the union the people of these isles have to try to find a more convincing and better shared language which explains the union or set of relationships across the four nations. The arrangements and institutions across the UK are changing and those between the four nations shifting. Scotland and England are moving from a marriage to a more negotiated, contingent cohabitation. Wales and Northern Ireland clearly have aspirations as well to find a more respected voice and status. This isn’t just a constitutional moment with regard to Scotland, Wales and Northern Ireland. It is also about economic and social justice, inequalities and imbalances, and the desire in all three territories to develop a different kind of state and polity from the dominant Westminster tradition. This confluence means that speculative talk of a hazy federal or confederal union does not take cognisance of this wider set of issues beyond the constitutional. The last thirty or so years have seen the growing absence of a popular British story. This is directly linked to the end of the post-war consensus in the mid-1970s which was a profoundly British sentiment which united large parts of the population and elites in a shared project. There were numerous differences and disagreements in this account, but within it there was a potent Labour peoples’ story of these isles and a moderate Tory British vision which had deep reach and resonance, and are both now threadbare and in what looks like terminal decline. Cast a glance over the competing mainstream British party leaders standing for Westminster. There is an absence of impressive statesmen and stateswomen and even more of the skills of statecraft and political diplomacy. In all the words and invective flying back and forth about tax and spend, the deficit and debt, not one prominent voice is offering up a compelling account of what this is all for and addressing what in this time of flux would Britain look like in 15 to 20 years time. The union may not be quite over yet, and it will certainly not be ended as a result of the decisions of voters on May 7th and whatever form of government emerges afterwards. But the old British stories are over – whether enlightened and progressive or reactionary and even radical right. The solutions for Britain are no longer to be found at Westminster and its interconnected elites. They are to be found increasingly in the alternative power centres and movements of self-government emerging across the UK and which are slowly embodying a very different politics and future. 1. Magnus Linklater, ‘Today’s Scotland feels like a foreign country’, Times Scotland Edition, March 18th 2015. 2. Magnus Linklater, ‘SNP’s misty-eyed euphoria will end in tears’, Times Scotland Edition, April 1st 2015. 3. Dan Jarvis (ed. ), Why Vote Labour, Biteback 2015.